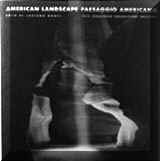 the images are collected in the book “AMERICAN LANDSCAPE” which includes 51 wonderfully printed 30x30cm duotones; precise notes specify kind of camera and lenses as well as film, exposure, developing and printing techniques with reference to the Zone System. The photos have been realized in the American South-West National Parks. Introduction by Douglas Kirkland; texts in English and Italian.